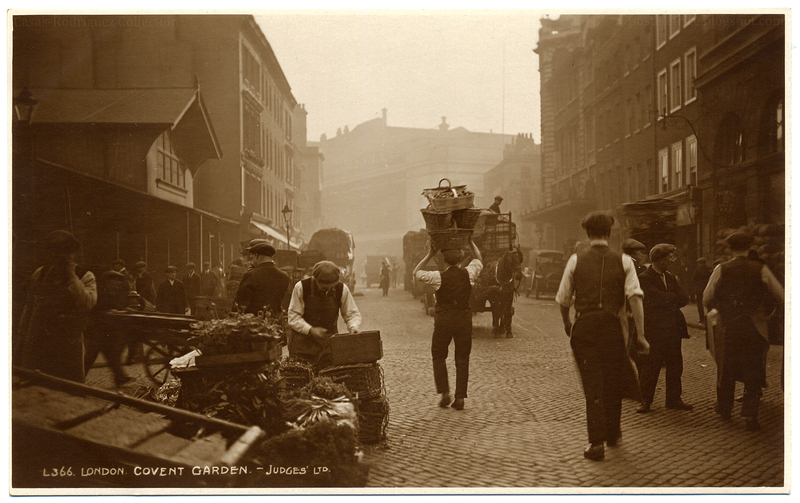 Covent Garden, circa 1925, courtesy of Postaletrice. Is this the future of San Francisco? But make a proposal [PDF] to simplify permits for small-time gardeners in San Francisco to sell their own produce, and suddenly the wood-paneled room becomes a giant love-in. In a town like this, who comes out against food? There is scuffling of feet. Everyone in the room who is not associated with the Planning Commission stands up. Most of them sport various signifiers of the new urban agrarians: Carhartts, beards, fedoras, plaid flannel, large-gauge earrings, artfully knotted scarves, feather earrings, sweaters with reindeer on them, clogs. A few of them are recognizable from a recent New York Times pictorial on the Bay Area food movement. Through the doors, even more people can be seen hovering, blocked from entry by a fire-code-conscious security guard. “You can clap,” she says. The room bursts into applause, and gleeful whooping. Large groups signing up for public comment are both what often sways a city meeting in favor of the side with the most numbers, and what makes those meetings run into the wee hours. Perhaps, Olague says, since everyone is in agreement, not everyone who signed up for public comment needs to come up and speak. It turns out that support for the measure is a bit more varied than a show of hands would initially reveal. Several people come up and say they don’t believe that gardens should have the same fencing standards applied to similar projects, because vegetables are so attractive, and watching people weed them creates a sense of community. Also: farmers are broke and chain link is cheap. Others complain about the permit fees to sell their produce, which could be in the realm of $400. Others want to include the right to sell produce at sites in the city other than where it is grown. Still others want the right to sell pies and jam and salsa. More applause, and a few whistles. “Unfortunately,” she says, “as a planning commissioner I can’t advocate for no fees.” She laughs merrily. “I have no problem with crops growing seven days a week,” says Commissioner Ron Miguel, who can always be counted on to tackle any legislative minutiae head-on. “They’ll do that whether we let them or not. But to allow selling from 6 a.m. to 8 p.m. in residential neighborhoods — we’re going to have a lot of kickback if that happens.” He is assured that local farmstands are unlikely to stay open that long. Miguel continues. He has reservations about the request to pool produce from multiple gardening sites and sell it in one location. His worry is that, given the difficulty of enforcement, the whole idealistic endeavor will be overwhelmed with opportunists selling produce that they claim is grown in the city but which is in reality from Chico. Commissioner Michael Antonini alternates between reminiscing about the Bay Area’s pre-sprawl agrarian past and wanting to make certain that neighbors have the power to object if someone is growing vegetables in front of their house. Fong then immediately goes for the dog pee issue, mentioning, somewhat cryptically, worries of “anything that might be left in your yard in the middle of the night.” He doesn’t want anything added to the legislation — he just asks the urban farmers of the Bay Area to be vigilant. “When my father was an immigrant he came here and and picked strawberries,” says Commmsioner Hisashi Sugaya. “That was as close as I got.” He goes on to say that, given that the Planning Commission has a hard time just enforcing massage parlor regulations, it’s a bit of a stretch to imagine that it will be able to run stings on any urban gardens that prove to be fronts for conventional fruit sellers. “I just wanted to comment that I fully support this,” says Vice President Olague, heatedly. “Up here we hear a lot of greenwashing — used to justify dense development. I think it’s so ironic that growing vegetables in your living space is so complicated. The commissioners cast their votes. Ayes all around, and proposal 2010.0571T moves on to the Committee on Land Use and Economic Development.